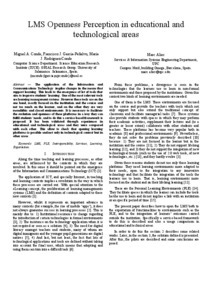 Conde , M.; García-Peñalvo, F.J.; Rodríguez-Conde, María J.; Alier, M.
The application of the Information and Communications Technology implies changes in the means that support learning. This leads to the emergence of lot of tools that aim to improve students’ learning. One of the most relevant tools are learning management systems. However these tools are on the one hand, mostly focused on the institution and the course and not too much on the learner, and on the other they are very monolithic and closed environments. It is necessary to facilitate the evolution and openness of these platforms in a way they can fulfil students’ needs, and to do this a service-based framework is proposed. It has been validated through experiences in educational and technological areas and they were compared with each other. This allow to check that opening learning platforms is possible and not only in technological context but in other areas. Conde, M. [et al.]. LMS openness perception in educational and technological areas. A: International Symposium on Computers in Education. "2012 International Symposium on Computers in Education (SIIE): Andorra La Vella, Andorra, 29 to 31 October 2012". Andorra la Vella: Institute of Electrical and Electronics Engineers (IEEE), 2012, p. 1-6.